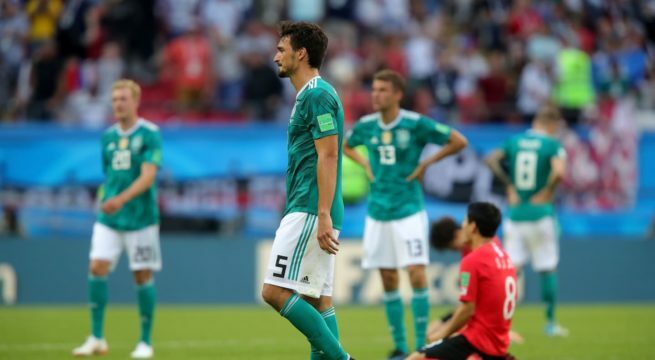 Germany, who are the defending champions of the World Cup have been eliminated in the first round by Korea Republic. The Koreans who had nothing at stake except their pride held the Germans who needed a win to a goal-less draw until the additional time of the match. In the 3rd minute of additional time, Kim Younggwon scored the first goal for the Koreans and 3 minutes later, Son Heungmin scored the second Korean, putting the final nail on the German coffin. A shocked German coach said “I’m shocked. Shocked because we didn’t manage to pull it off and beat Korea Republic and we lost this game. It wasn’t my impression when I spoke to the team before that they were under pressure before the match because the Sweden game was on at the same time and we really had the feeling that our team wanted to move ahead and qualify for the knockout stages. “How do we go from here? We’ll have to talk about it calmly and I think it’s premature for me to say something. It will take me some hours to come to terms with it and I’m incredibly disappointed by this elimination. Both Germany and Korea Republic have now crashed out of the World Cup.